Updated: 11/24/18. Stark Hollow Farm made the decision to scale the farm back significantly. We have moved to Montpelier and will not be breeding this season. All of our prime breeding stock was sold to other breeders throughout the United States. We will be breeding approximately 9 ewes in the fall of 2019 and will have some breeding stock available in 2020. Please stay in touch! To access info on our past breeding stock ---> Past Breeding Stock. 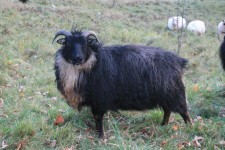 Camox is a beautiful black mouflon out of Poppy and Ember. Super friendly, excellent conformation, lovely fleece. She carries the spotting gene. Erika is a lovely solid moorit ewe out of Cricket and Ursus. Solidly built, with great fleece and wonderful conformation and disposition. AI genetics include 1/8 Bambi, 1/16 Rektor, 1/16 Kari. A super friendly and well conformed ewe out of Eskar and Giacomo. Lovely coppery fleece. This girl was held over for breeding in 2017.